Home » Jonny » Wonka Giant Chewy Sweet Tarts – I say Yes. Wonka Giant Chewy Sweet Tarts – I say Yes. Sweet Tarts, in their various iterations, have been around as long as I can remember-and that’s not saying much, folks, my memory’s shot. However, there’s no denying that I favored the long rolls of small, hard Sweet Tarts as a kid. Hell, I still love them, but sometimes the uber-hard aspect of them isn’t what I’m craving. Enter the “new” Tarts. 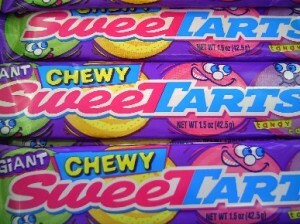 Giant Chewy Sweet Tarts, that is. Instead of 20-ish, you get 4, one in each flavor: grape, apple (I think), lemon and cherry/strawberry/berry/general “red” flavor. These bear almost no resemblance at all to their small predecessors. There’s just something about these that makes me ALWAYS in the mood to rock a pack. And about that-they’re only 30 calories a piece, which makes eating a whole pack no biggee on the waistline. And that’s important if you’re like me and plan on eating a LOT of candy in one sitting. Back to the point: the consistency of these is kind of the “thing” about them: they’re chewy, but you sort of have to work them in your mouth with some saliva to “loosen” them up. From there, it’s a challenge for me NOT to devour the whole thing in one glorious, sour, flavorful bite. Occasionally I can restrain myself and make it a 3 biter, but for the most part…it’s a quick process for me. y might taste similar to the original Sweet Tart flavors, but I really don’t think so. They’re kind of unique. Which brings me to the red flavor. There’s certainly nothing bad about it, but it’s always the last one eaten, and that says a lot. Then again, I’m not now nor have I ever been a cherry/strawberry/red general flavor fan, so there you have it. I’l say it again though: it’s still good. It stands to reason that one would think these these two products taste the same, or at least similar. These little pellets from hell are like weird silicon teeth attacking nightmares. Not tasty, not real flavorful, and just blecch. Avoid them at all costs. But back to the good news: Giant Chewy Sweet Tarts rock, and thankfully, it seems like I’m seeing them around in stores more and more. If you like sour candies at ALL, you owe to yourself, and frankly, to ME, to buy a pack. Bottom Line: Yes yes, y’all. Nothing bad to say about these semi-classic confections. I need to try these. I need to get to a 7/11 stat. Sweet tars by Wonka Candy just don’t taste the same. Has anyone else noticed the difference. I don’t think I will be eating any of wonkas cheaply made candy ever again. I will miss my sweet tarts. Interesting that you say that…I think you might be right. I was noticing something too. I think we need to do some kind of taste test.